Tooting Bec Lido is one of the largest outdoor pools in Europe and in spite of being subject to vandalism and crime, comes alive in good weather. 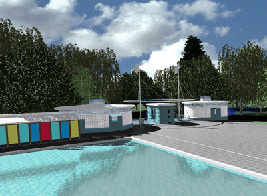 Wandsworth Borough Council, as part of regenerative scheme for the pool, commissioned a new entrance complex consisting of hot showers, changing facilities, toilets and a ticket office. The new entrance facility offers direct views into the lido, provides secure low maintenance facilities, and maximizes passive surveillance. Amenity space is added adjacent to the lido by connecting with a garden, and a new terrace, adjacent to the refurbished Cafe. The works were programmed to minimise disruption and were completed for circa £600,000.00.